Enjoying palm trees overhead and grass skirts rustling while listening to music and folklore of the Hawaiian people. This is what a many picture when they think of a luau in Hawaii. Our family experienced the new Disney Aulani luau, KA WA’A, on our recent trip. If you’re looking for an Oahu luau, KA WA’A at Aulani is a great family-friendly option. Here’s my guide to what you need to know! There are two options available for tickets, VIP and General. The VIP option gives you some perks. One of the most notable perks with the VIP ticket is an earlier entry time for the luau. This is a benefit if you have young kids who will want to try each of the special cultural activity booths. The VIP ticket also gets you complimentary alcoholic and non-alcoholic drinks. VIP guests also receive a more substantial lei necklace compared to the single strand given to General guests. Disney Aulani KA WA’A lawn / table seating. Stage (not pictured) is on left side of photo. As far as seating goes, the VIP tickets were closer seating to the main stage. However, all the seats are on the same level at long tables, so the view isn’t spectacular from any vantage point unless you’re at the front point of the middle aisle tables. If you really want great seats, I’d opt for the VIP option and arrive perhaps 15-30 minutes before they tell you to arrive. Nightime at the Aulani Luau – VIP seats are closer towards the stage. VIP tickets cost $169 and $109 for children. General KA WA’A tickets cost $129 for adults, $79 for kids. Kids are considered ages 3 to 9, so any kids 10+ years old will be considered an adult. Note that you’ll actually purchase your luau tickets via a third-party, Pleasant Holidays. Prices include gratuities, but tax is additional. I do feel the price is high for the experience. Hopefully this guide will help you determine if it’s a valued vacation expense for your family. TIP – Seats aren’t assigned in advance and appear to be given as you arrive. Therefore, arrive earlier than your specified check in time. TIP – The luau is only performed on certain days, so be sure to check the schedule before making plans. As I mentioned above, arriving early gives you the opportunity to participate in the cultural activities set up around the area. These were a big hit with kids of all ages, and even adults can enjoy them. These activities are what I think make the Disney KA WA’A especially family-friendly. While you can’t make a full flower necklace, you can create a small floral lei which you can wrap around your wrist or ankle. Another booth had handmade reed & flower bracelets that could be tied to your wrist. This booth wasn’t really a creative opportunity, just a chance to get a handmade item to wear during the luau. The kids seemed to really enjoy this booth. They got to use a traditional mortar and pestle to grind up some taro root, making the traditional Hawaiian food, poi. You could use naturally made stamps to stamp on paper and create your own bookmark. This one was a big hit – getting a tattoo! I’m not sure what they were using at ink, but it was easily washed off with soap & water. I’ve been to two other luaus and this one was a bit different compared to most. The early on activities make the waiting time great for kids. And being Disney, the show itself is definitely family-friendly. Other luaus I’ve attended spend more time teaching about the culture than KA WA’A did in my opinion. KA WA’A is more of a fictional story versus a cultural experience. While there definitely are cultural discussions and mentions, the show is less about that then other luaus I’ve experienced. KA WA’A features a brother and sister storyline, very Disney’esque in it’s approach. There are some dances and other characters make an experience, but the brother / sister storyline is the focus. I can say that I was very happy with the food offerings at the luau. Our whole family found a nice variety of food that interested all of us. Most of it was even still hot, which I was worried about since it was brought out at the start of the event. It was your standard buffet fare quality, not fine dining, but certainly tasty enough to enjoy! Dishing up & trying new foods! Mia has severe food allergies and I’m happy to report that the chef met with us and made a special plate for her in the kitchen to be brought out separately to prevent cross-contamination. The chef prepared an allergy-friendly plate for Mia! We had a fabulous time at the KA WA’A Aulani luau. 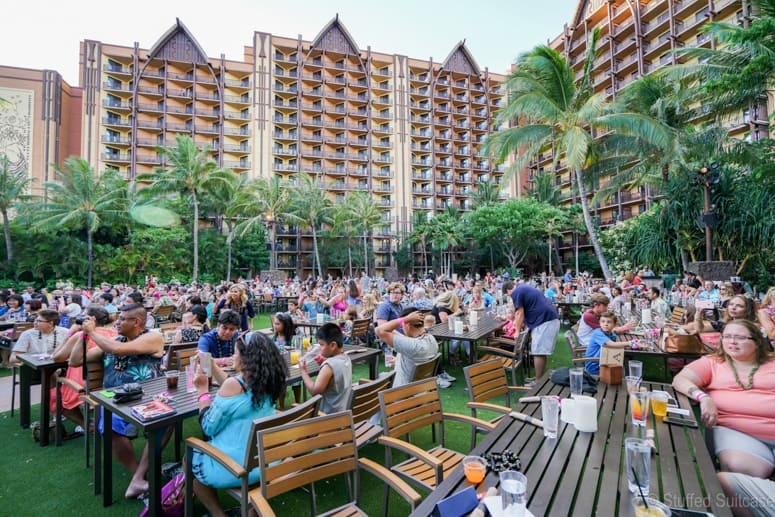 Luaus are a traditional experience to enjoy when visiting Hawaii, so I’m glad that Aulani offers a family-friendly option for guests. Again, the price is a little high in my opinion, but Aulani has done a great job of offering a Disney’esque experience for families. Feel free to comment below if you have any questions about this Oahu luau!